Ready to Distribute--or Add Company News! Start Now, Pay Nothing, Decide Later. Trustworthy--Written by licensed mental health professionals with a min. of 25 yrs. experience. Tested to the Max! Distributed Internally by Hospitals and Health Systems nationwide! See What Subscribers Say--Testimonials! -- Need phone numbers to phone a few? Just ask! Inspire healthy behaviors and productivity, build better relationships, and encourage self-referral for personal problems and concerns. By the way, emailing these newsletters is GREAT. So easy to edit, turn around, and send. Thanks for your help. Happy Thanksgiving. We enjoy your articles each month and I thank you. I can’t say enough about the two FrontLine publications we subscribe to. We are a small company who is a provider of EAP services to small and medium companies. The FrontLine Employee employee newsletter makes me look like a genius!! All of our client companies love the publication, so please don’t ever stop publishing it. I could never do it on my own. We value our relationship with you and really like the employee newsletters. After years of struggling with the employee newsletter arena -- a fantastic solution! Upload FrontLine Employee to your Web site for easy anywhere, anytime viewing. Ready for Copying or Making Changes! Arrives monthly--a week early! Request a PDF, MS Publisher, MS Word (with graphics), Text-only, or all four options. Articles encourage self-referral and tackle common problems of every type. Exclusive subscriber hot line allows you to make suggestions for content in future issues. E-mail the text, create a PDF file, or use just the text in existing in-house publications. Place on your Web site (with password protection). Your imagination is the limit! As Close as You Can Come to having Your Own Newsletter with NONE of the Work! Ready to use or edit. PDF, MS Word, customized PDF, or MS Publisher. 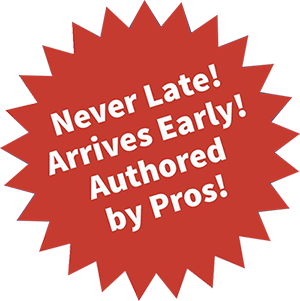 Distribute upon arrival or make changes by adding your own content. Short, informative, punchy articles keep readers engaged so they get maximum benefit. Low price — unlimited use. You control everything. Two pages monthly. No long-winded articles or lengthy features that cause your newsletter to be put down and forgotten. Licensed mental health professionals write, produce, and approve content you can trust. Effective articles empower employees with new information and topics that delve deeper. Not the same old health and wellness articles. Flexible. Create your own name. Use articles in your existing newsletter and avoid mad searches for content. Everyone will love FrontLine Employee or we will refund 100% of the price you paid for your subscription. Human resource managers, EAPs, and employers of all sizes use FrontLine Employee as a reliable, on-time communication tool that delivers productivity tips, workplace wellness information, and the ability to add internal news (if desired) so the organization maintains an enjoyable, predictably read communication vehicle that employees enjoy, but also a risk management and productivity tool that earns strong top management approval. Employee newsletters are powerful tools, but maintaining your own internal newsletter on a regular basis and getting it distributed on time, every time, is nearly impossible. If this task is assigned to an employee with other responsibilities, eventually you will observe that it ceases to continue. The chore is insidiously difficult. This is why FrontLine Employee was created 17 years ago, and why it is used by the U.S. Congress (both houses), the State of New York, many U.S. Army installations, universities, municipalities, hospitals, nursing homes, and other businesses worldwide. FAX PAGE FOUR OF THIS BROCHURE FOR A FREE TRIAL. You have a unique opportunity to powerfully influence your employees' health, well-being, and productivity with a newsletter that doubles as an in-house communication organ and wellness/productivity tips resource. It's Your Own Newsletter Without the Work. FrontLine Employee is two pages. It comes monthly by e-mail and is editable in MS Word or MS Publisher. 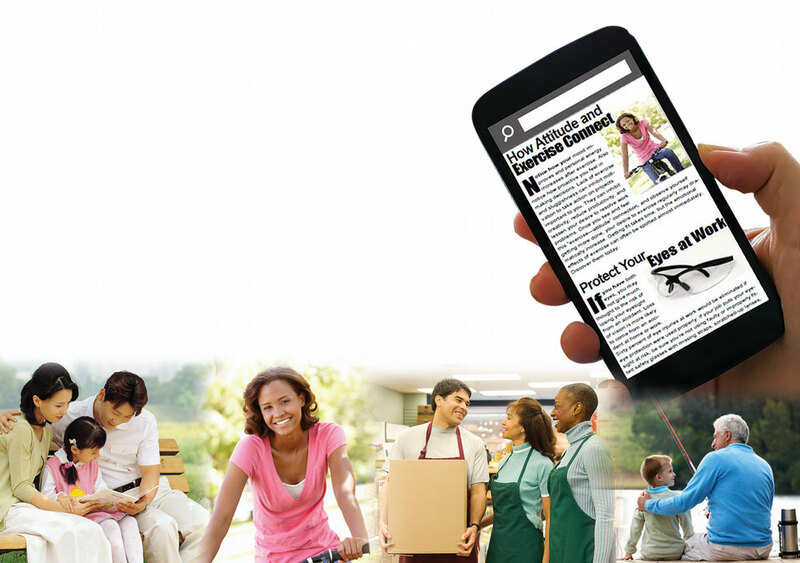 Or you can receive text of articles and a PDF, or all of these formats at no extra charge. A customized nameplate--professionally created--is 100% free. Use MS Word (text only) if you already have a template and only need great content written by licensed, experienced mental health professionals who are EAP pros with no less than 25 years experience. FrontLine Employee can also be sent to you as a ready-to-use PDF complete with your name and logo already on it if desired! The charge is $100 per year additional. The masthead we produce for you can easily be applied on your own, but we are happy to do it as well. You can see samples of nameplates/mastheads below. When Frontline Employee arrives, send it to your employees or add your own news before doing so by simply removing any article. Insert messages from the CEO, birthday announcements, company anniversaries, event reminders, or secret recipes that employees want to share! It's your newsletter. You can work with it any way you like. We do not have copyright marks or our logo on your newsletter that would distract readers. We are the only newsletter provide in the USA that does not have branding directly on the product. Would a unique employee newsletter name and masthead make your newsletter perfect? We will professionally create an employee newsletter masthead FREE with your subscription. Send us your special name, logo, Web site URL, and industry-focus. We will take it from there and give you a minimum of three different choices/ideas. We will keep tweaking with your ideas until you love it at no extra charge. FrontLine Employee provides health and wellness tips, stress management techniques, and workplace and job productivity ideas to help employees do their jobs better. Employees and family members love FrontLine Employee because articles are quick reads, never long-winded, and contain lots of "how-tos" and practical advice that can be used immediately. FrontLine Employee covers a huge range of popular topics, concerns, issues, and common problems: dealing with difficult people, how to get along better with the boss, productivity tips, resolving conflicts, staying excited about work, and how to find more meaning in one's job. These are the topics employees want a newsletter to contain, and with Frontline Employee you get them. Our "subscriber's hotline" -- http://workexcel.net/hotline.html allows you you to request topics your employees need and want to read, like dealing organizational change, death in the workplace, or other topics associated with crises or internal concerns affecting morale or the work climate. FrontLine Employee discusses respect in the workplace, stopping rudeness, avoiding harassment, ending gossip, and creating a welcoming workplace for all. We also discuss employee substance abuse and alcoholism in the family. Only licensed mental health professionals with a minimum of 25 years life and work experience author or approve content in FrontLine Employee. You get your life back with FrontLine Employee because you don't waste time looking for content or writing it. Your time is costly, but FrontLine Employee is not expensive. It's as low as $1.35 a day for a small company! And if you are an EAP provider, we permit you to distribute FrontLine Employee to your corporate customers for a super low reasonable rate. Do You Know Someone Using FrontLine Employee? FrontLine Employee is used by the state of New York (yes--all state government employees receive it monthly), big and small employers, the U.S. Army, scores of hospitals, counseling centers, the State of Washington, cities, HR departments, and employers world-wide. As you can see, with a subscription you are in the company of many employers that must depend on a reliable service. 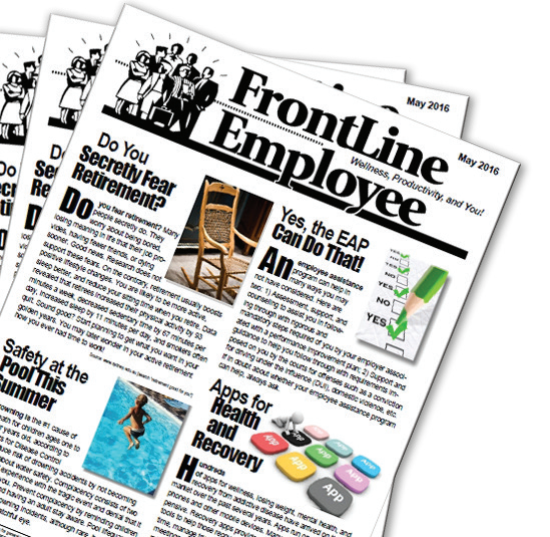 Each month, you receive an e-mailed, editable copy of FrontLine Employee. 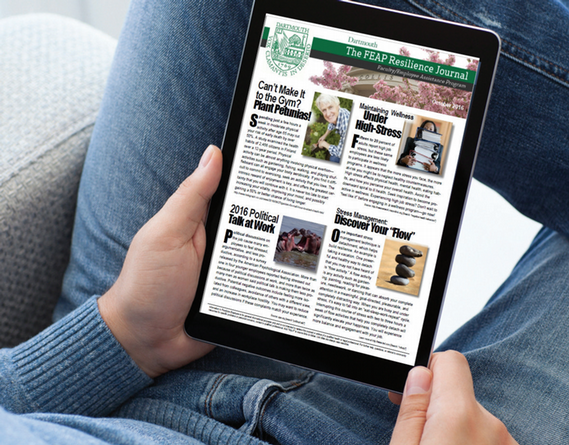 You can choose MS Publisher, MS Word with graphics or text only, PDF, or all four of these formats at no extra charge, so you have all the tools you need to instantly get your newsletter flying off your desk. You receive a free professionally produced, colorful masthead with your own title, if desired, so you can simply paste it into the newsletter with one click when it arrives! The look of your masthead will match the energy of your company, create excitement, and reflect the commitment of your organization to the products or services you offer. You desired, you can have a Spanish version of FrontLine Employee at a super discount. It is called Empleado de FrontLine. Latino employees who speak only Spanish (or read Spanish better than English) will not be left behind in your company. Are you able to see how Frontline Employee reduces risk and how it can make a powerful contribution to helping your employees stay happy, healthy, and productive while reducing your workload? Distribute the tip sheets using your website or via e-mail, or simply copy and place them anywhere--in your health clinic, main office, lunchroom, or break room areas. Many subscribers have continued with FrontLine Employee since our very first year in 2001. So, I know you will love it. If you ever feel that FrontLine Employee isn't the most awesome and hassle-free solution for starting and keeping your company newsletter going, then I will refund 100% of the price you paid for your subscription, at any time, even if you happen to be on your very last issue! 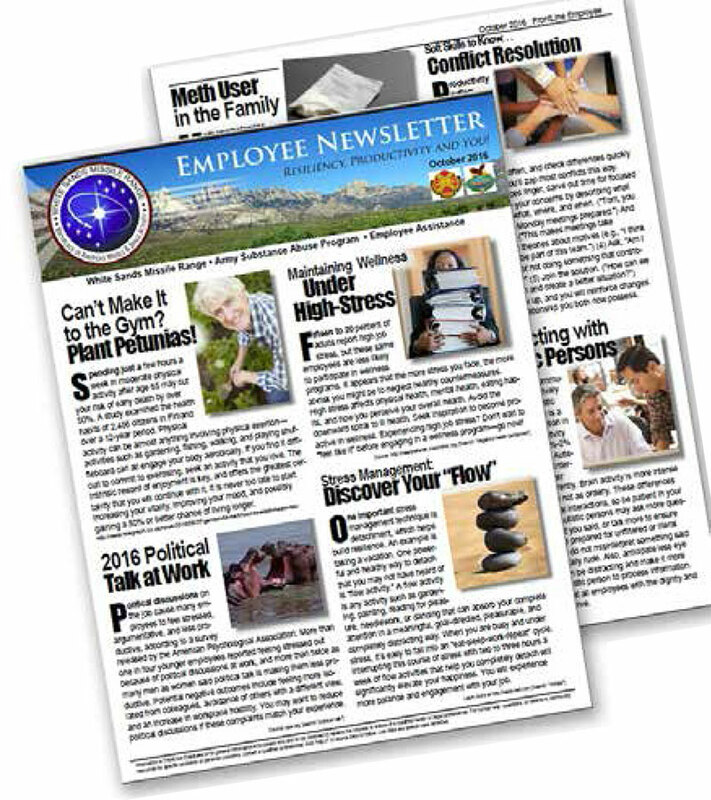 Employee newsletter subjects and topics you should consider include a variety or mix of wellness and productivity content that will meet the needs of employees, family members, and the business organization itself. "Critical" sounds like a dramatic word, but placing the right kind of employee newsletter content can create a powerful effect toward influencing desired behavior among employees. 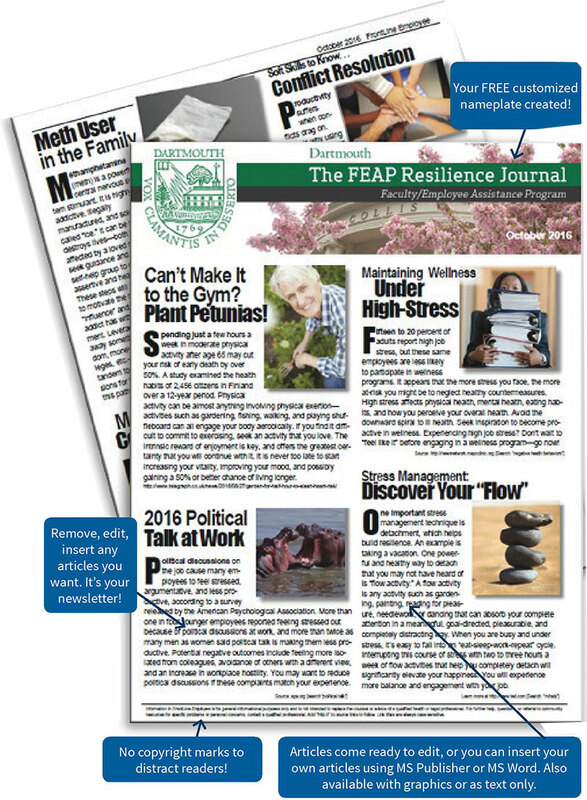 We are convinced that newsletters with properly written articles can play key roles in reducing conflict, increasing respect in the workplace, reducing incidences of violence, and possibly motivating a suicidal employee to make one more step toward getting help. So newsletters are all about reducing risk. And I am only scratching the surface of what newsletters can do for employees and their employers. The bottom line is that employees represent a "captured audience", so if you give strong attention to employee newsletter topics that fit the work culture and meet the needs of employees, you will see interesting changes that have a positive effect on the environment. Below is a discussion of what I consider twelve important employee newsletter topics with a closer examination about what each one means. It should provide you with a lot of great ideas for future articles. Using Employee Newsletters to Make a Huge Impact on Your Workforce? Employee or company newsletters are now easy. 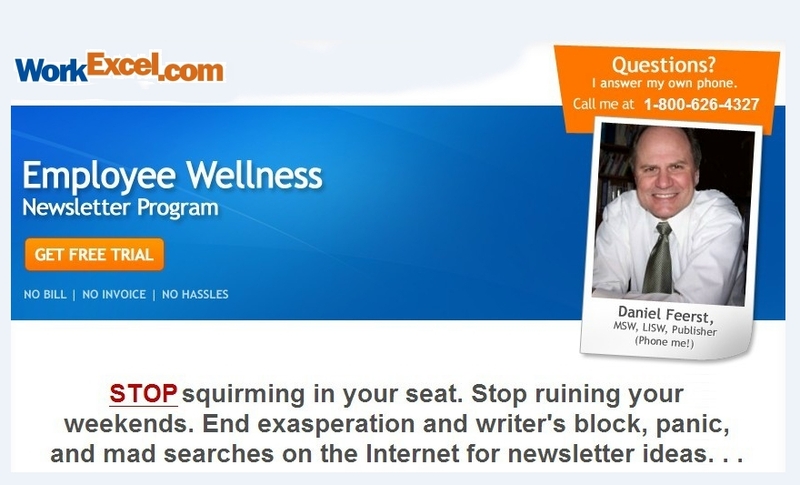 We provide you with a ready-to-use, 100% editable, completely rename-able, employee newsletter with wellness and productivity tips. It's devoured by employees because of its actionable content. Use Frontline Employee AS YOUR OWN newsletter for internal company communication while combining its wellness and productivity impact. Add your own news, or not. Amend or change content, or not. Rename it, or not. Distribute it anyway you want. And flexibility? We e-mail your employee newsletter to you in any format--PDF, MS Word with Graphics, MS Publisher (our favorite) or PDF. You can have any or all formats at no extra cost. Do you need your own professional-looking masthead and employee newsletter name? We'll create it free. Send us your logo, Web site URL, and special name for the newsletter. We'll take it from there. We will keep tweaking the look until you're thrilled. No charge. Can you suggest article ideas? Yes! We use 95% of suggestions from subscribers, and we LOVE hearing from you. Who authors our employee newsletter content? Only licensed mental health professionals with a minimum of 20 years workplace wellness and employee assistance experience. Nothing less. You will recognize immediately the power of this policy in the content you read. Articles focus on improving productivity, motivating employees to seek help for personal problems, wellness, personal development, family life, managing stress, getting along difficult people, effective communication, and hundreds of other topics employees want and need, like getting along with boss, customer service stress management, getting the job done right the first time, getting to work on time, substance abuse in the family, and related topics. Your employee newsletter arrives the prior month! It is never late. This removes the stress and burden of newsletter production you might have experienced in the past doing your own newsletter. Our only rule: Please do not make FrontLine Employee accessible on an unprotected Web page, and do not share it with another employer. Refer them to us for a free bonus extension of your subscription! Phone 1-800-626-4327 (24/7) to become a subscriber right now, or if you're psyched, use the shopping cart right now and get 14 issues instead of 12! Our refund policy: 100% up to and including the very last issue of your subscription. Period!